All Saints National School (Est. 1847) is located on the Main Street of the town of Carnew, Co.Wicklow. We are a two teacher school (under the patronage of the Church of Ireland Bishop of Ferns). Our school aims to provide a postive environment where children of all faiths are welcomed. Children are encouraged to be enthusiatic, caring and hardworking in order to reach their full potential. Both classrooms are equipped with interactive white boards and children’s computers. 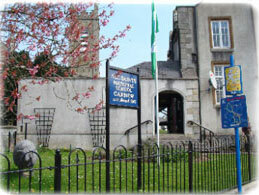 beside the Church of Ireland Church is a circa 1840 building of three bays and two storeys with rendered walls, granite, chamfered dressings, transom and mullioned windows, a high pitched roof and gables. There is a wing on the east containing the door case. There is a large playground for the children at the back of the church with grass and tarmac which are marked out for basketball and playground games. The former teachers residence was completely renovated in 2000 to provide a very large meeting area which can be divided into two rooms when necessary. There are also modern kichen facilities and toilets upstairs. Downstairs, in the school there are two large classrooms and a secretary's office. Children have access to computers in both rooms. School opens at 9.00 am and children are brought inside and supervised from that time. As class begins at 9.20 am it is important that all pupils have arrived by that time. The Board of Management (BoM) can give no undertaking that children will be supervised and can accept no responsibility for children who are on the premises before 9.00 am or after closing time. The Woolgreen garden was established in 2005 as part of the school's Green Flag initiative. Our fourth Green Flag was raised by Matthew Porter and Jack Doyle-Roche with Tom Porter in June 2011. Jim Callery the Environmental Officer for Wicklow County Council attended.